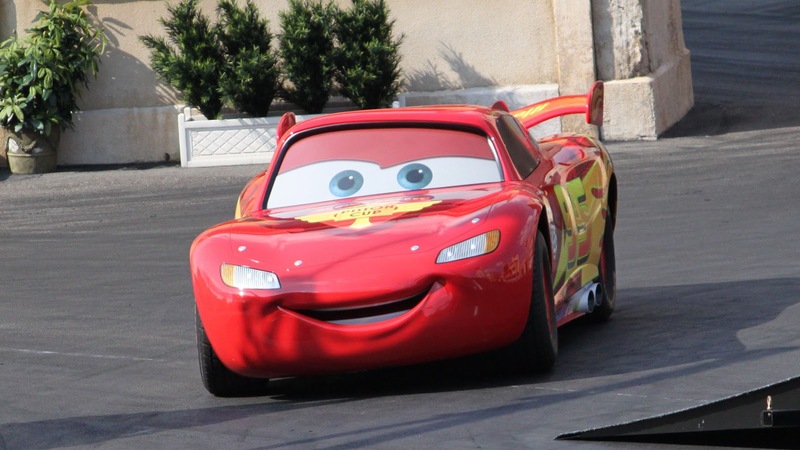 Tucked away in the far end of Disney's Hollywood Studios in Orlando, beyond The Streets of America, is the Lights, Motors, Action! 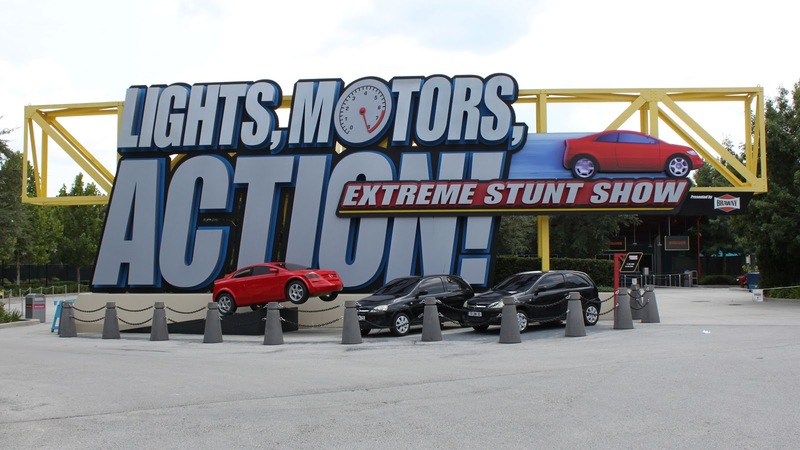 Extreme Stunt Show attraction, one of the "must sees" of the park. Disney brought the attraction to the then named Disney-MGM Studios in 2005, hoping to recreate the success of the Moteurs...Action! 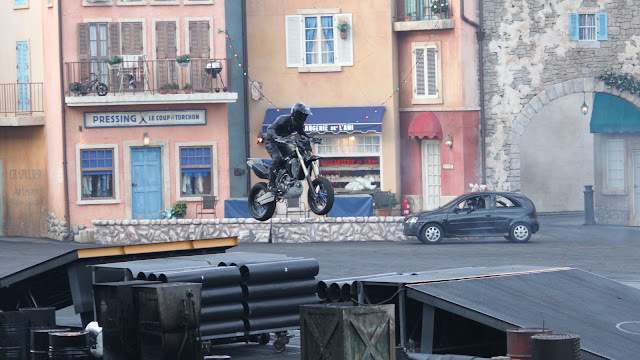 Stunt Show Spectacular attraction at their Disneyland Paris park. The attraction is an auto stunt show that features specially designed stunt cars equipped with motorcycle engines and hand-operated stunt brakes, capable of performing amazing maneuvers. 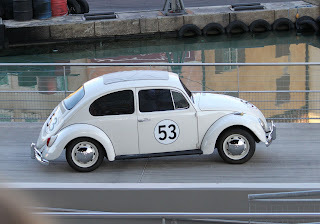 The premise of the Lights, Motors, Action! 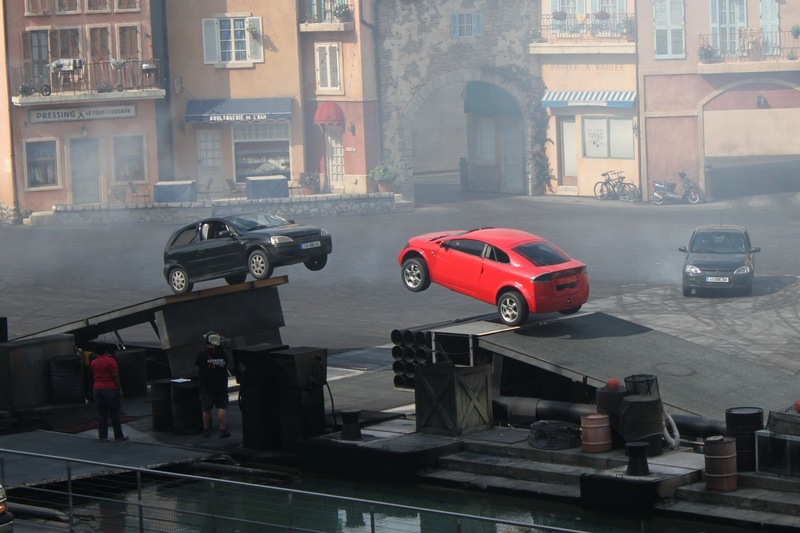 Extreme Stunt Show is that the audience has been permitted "backstage" to witness the filming of several key stunt and special effects scenes that will complete an upcoming action film. 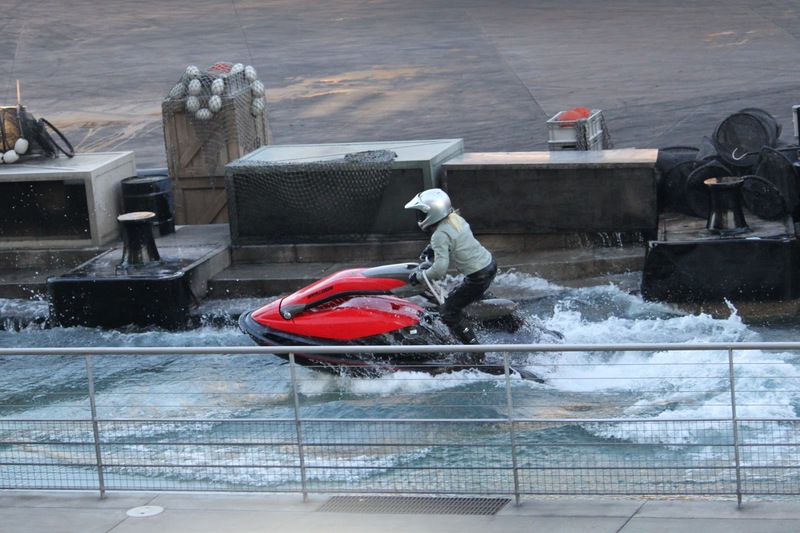 The forty minute show features motorcycles, jet-skis, stunt performers, and the film crew charged with capturing all the extreme stunt action scenes. 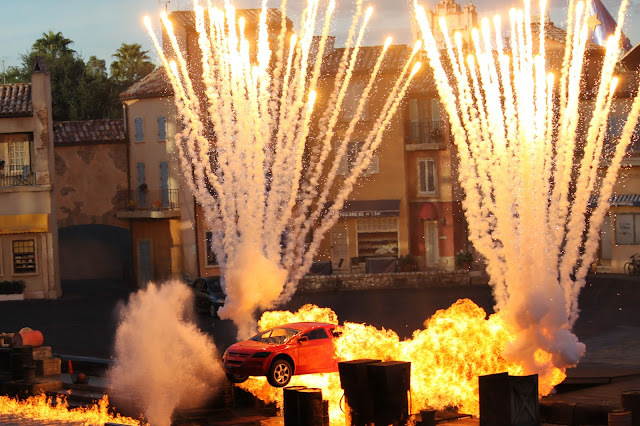 These scenes include motorcycle and car chases, stunt falls from a four story building, and dazzling pyrotechnics. The show is hosted by the director of the fictitious movie being filmed and members of his/her crew. 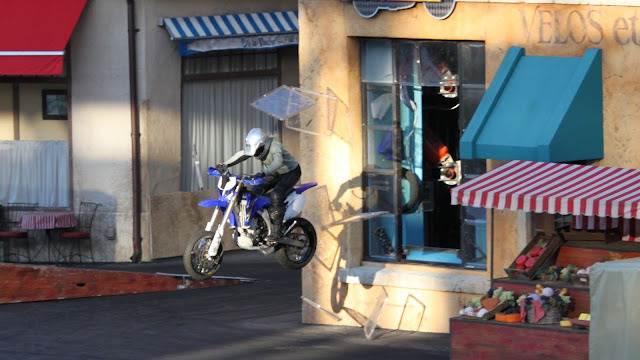 A huge video screen mounted atop the facade of the French village set enables the audience to watch footage of the live action being filmed by the crew during each take. 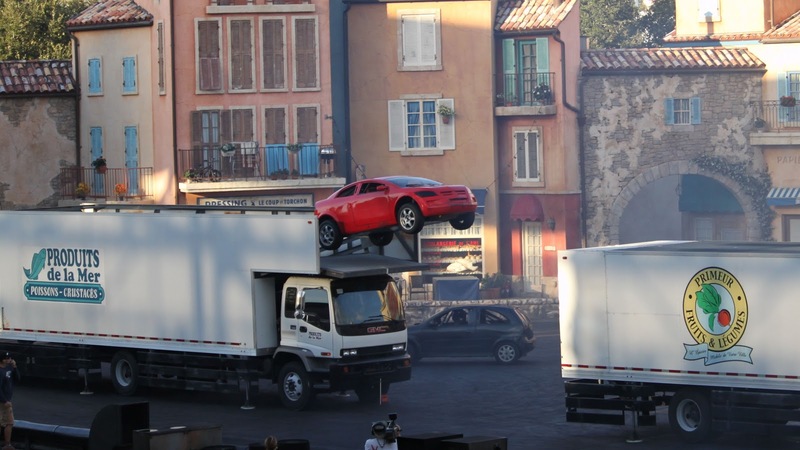 This footage is edited together with pre-recorded segments featuring the fictitious film’s “star” so that by the end of the show, the audience is able to view the completed action sequences that were on the crew’s shooting schedule. lighthearted moment, audience members are treated to a cameo appearance by Disney/Pixar superstar Lightning McQueen, who has replaced the previous vehicular cameo of traditional Disney star Herbie the Love Bug. The Lights, Motors, Action! 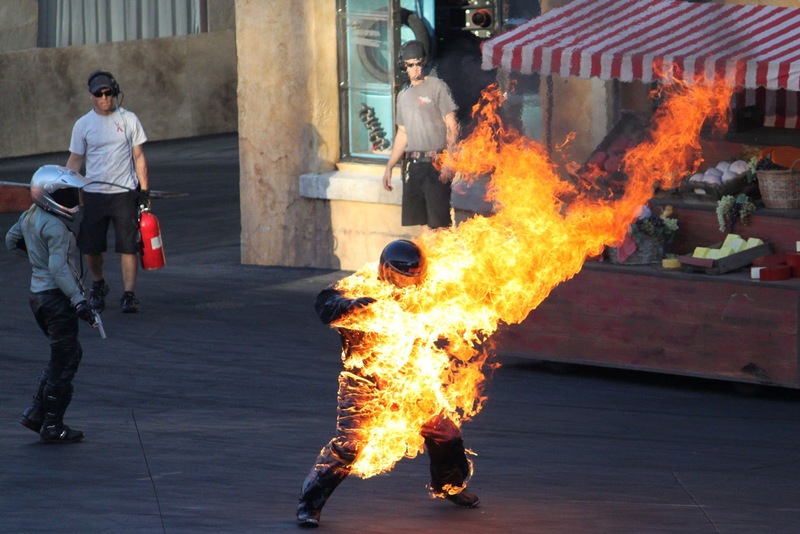 Extreme Stunt Show should be on your list of must sees at Disney Hollywood Studios. It is packed with action and special effects and offers a unique glimpse into the making of movie magic. There are some laughs sprinkled into the show and it is truly a unique theme park experience, as always, done Disney style. “Extreme” is in the name, so be warned that the show can be very loud at times (screeching cars, revving engines, explosions, etc.) and is not suited for infants and very young children who may become frightened. If you are looking for photo opportunities, this show definitely has them. You have to be quick to quick to capture some of them, so be ready. If you are a real photo enthusiast, this the place to take your digital SLR with the telephoto lens and the high shutter speed settings. Set aside time for this show in your park plans for the day. Showing up at the very last minute can leave you out in the cold (or perhaps more appropriately, the heat), so you will need to arrive at least 15-30 minutes before show time. During high volume attendance, you may need to arrive earlier. 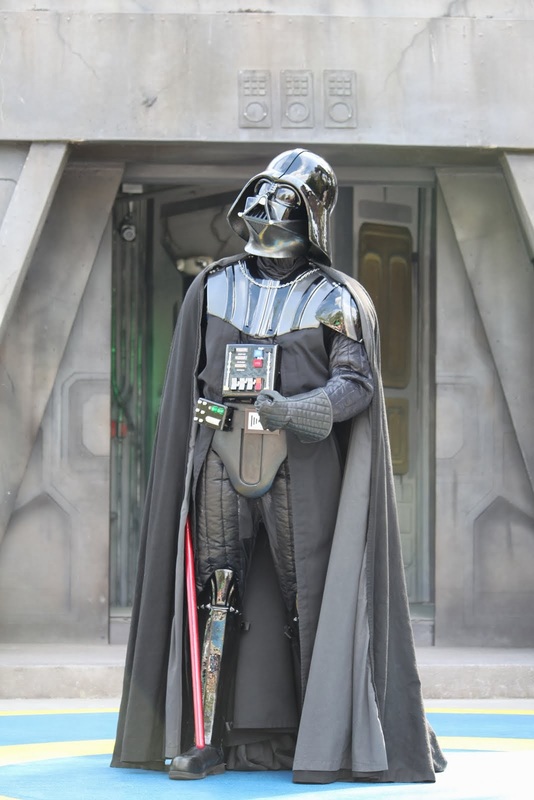 The best bet is to ask cast members for guidance when entering the park. The show itself if 35-40 minutes long and it takes some time for all of that humanity to spill out of the theater and back out into the park. 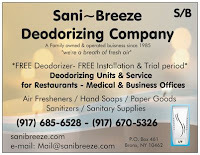 The bottom line is that you need to set aside a minimum of an hour for the whole process. This may play into your decision of whether or not to include the Lights, Motors, Action! Extreme Stunt Show into your Disney Hollywood Studios itinerary. 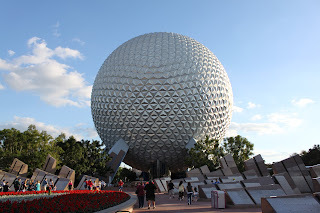 For those beaten down by trekking through the park all day in the oppressive Orlando heat, the show offers a chance to sit and unwind for a nice chunk of time. There are some rumors swirling around online that in the future, this attraction and the nearby Studios Backlot Tour could be replaced with an Orlando version of Disneyland's very successful Carsland.